in a clay pot, under a mango tree with fruits. 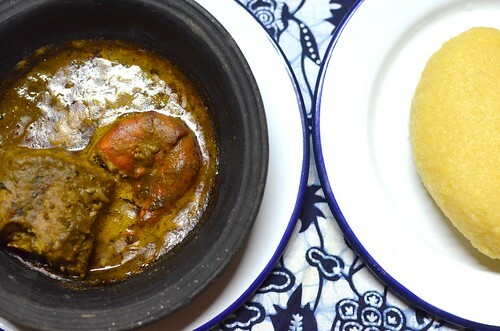 We’d been married only a few weeks when I decided to make ‘Banga soup’ for the first time. For my husband. As far as I was concerned, this was a rite of passage, an adult kind of bar mitzvah that would earn me a title, confirm my place as his true wife. 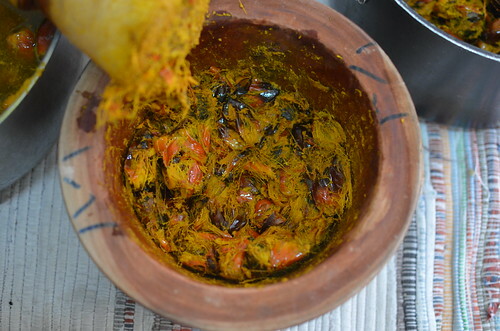 I had grown up feasting on Banga. With fresh fish, with chicken and beef, on rice, with starches…and just plain licking the soup, but make it? I’d never done. 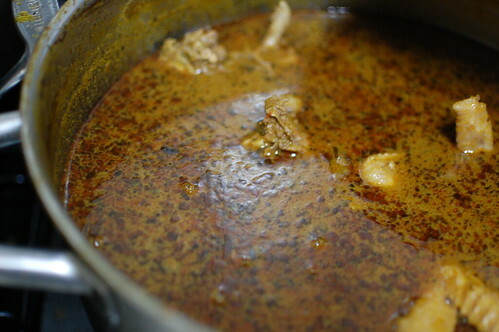 Banga soup is a very special sauce made with the rich pulp of the palm nut fruit, not to be confused with palm oil, or palm kernel oil. 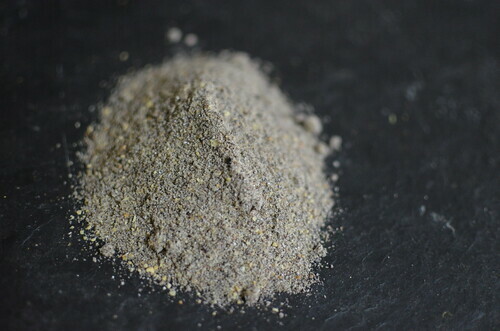 Its lovely orange hue transports rich and silky flavours, best developed and best served in a clay pot. For the Nigerian clay pot speaks to our history and heritage – a precursor to the romertopfs. The clay pot, ‘evwere’ is a cooking vessel that lends earthiness to that cooked within, and is excellent in reducing cooking liquids! See, my husband and I are both from the south of Nigeria, where ‘Banga’ is the flagship of soups. It is how southerners from the Niger Delta are recognized. When people ask where you are from and you say Delta state, they almost always go ‘Hmmm, Banga soup.’ A sure conversation starter. The name? An ice-breaker. Americans would call some varieties ‘surf and turf’ as they combine seafood and meat. 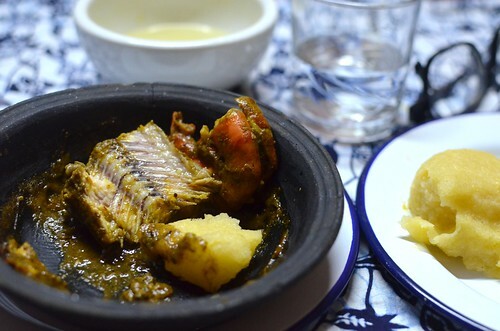 Banga soup is often served with ‘starch’, a really glutinous by-product from the processing of cassava, that is a stretchy and chewy, jelly-like mass similar in some respects to Coco de Nata. It can also be served with other cooked starches like pounded yam, eba (made from cassava meal called garri or gari), amala (made from dried yams or unripe plantains) and whole wheat flour. These starches resemble bread dough (from the first kneading), though much lighter. To eat them, you pinch off a small ball of the starch, dip it in the soup, using it to soak up the juices (with finger bowls of water provided, for the new and uninitiated). 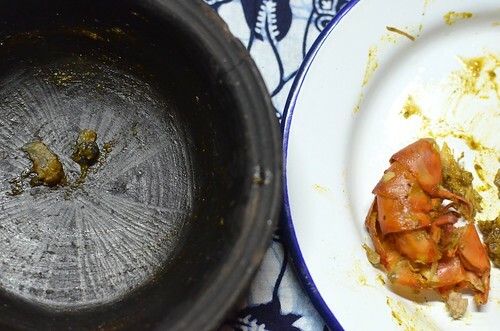 The night before I embarked on this venture, I rang my mother – I’d never made Banga before. She gave me all the instructions – the how-tos, when-tos and why-tos. I hurried to the end of our conversation, anxious to get to bed, eagerly awaiting the dawn that would establish me as ‘his’ woman. 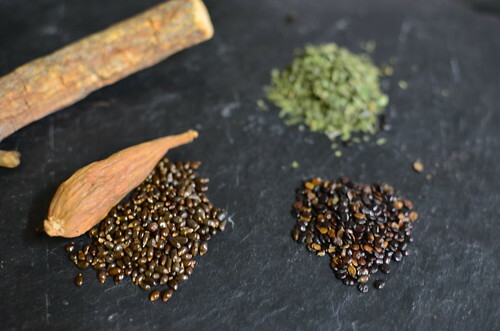 I had my spice mix ready – a small bag choc-full of aromatic scents, provided too by my mother – a few heaped teaspoons and the soup would be balanced in flavor. She said. I’d done everything I needed to do to begin making my pot of soup. I’d boiled the palm nuts till cooked and pounded them to bruise the skins in a huge wooden mortar. I’d extracted the liquid by soaking the bruised nuts in boiling hot water and straining it. Messy but unavoidable for the palm juice was the ‘bottom line’. I didn’t know then that one could totally eliminate this step – and just buy cans of palm butter. That was to come many years later. I was going to cook with soup chickens – old layers, mature birds, with good flavor and tasty flesh. There would be freshly caught Tilapia fish too, beef and the freshest tiger prawns ever. For me, the most important thing was what to do with the prawn heads. I’d seen my mom blend them and add the mixture to the soup. The prawn heads would do two things – one, thicken the soup and two, amplify the seafood flavours, creating the perfect ‘coastal’ taste. 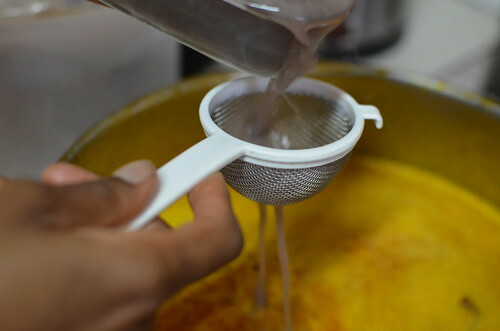 What I’d omitted from my eye bank was the fundamental step of straining the blended shrimp mixture – reserving the liquid and discarding the chaff. Can you see where this discussion is headed…but I shall not digress. This technique is similar to the French bisque and chowder where seafood shells are pureed, strained and then used to thicken the soups. Bisque is a type of soup that’s rich and creamy, and traditionally made from pureed shellfish. Authentic recipes ground the shells into a fine paste and use that to thicken the soup. Oh Love. Doth cover. A multitude of sins. 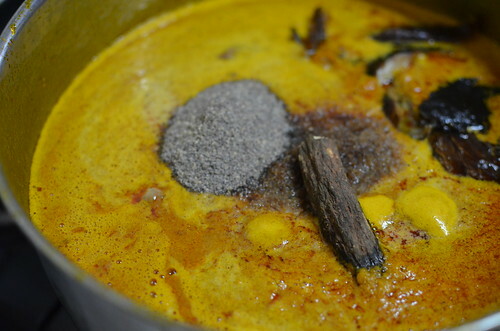 And so the journey began, palm nut sauce, meat and banga spices went in a pot. I let it simmer for half an hour and then checked for seasoning. I couldn’t taste the distinctive, aromatic spices, so I added more and more of the spice mix…..double, triple, quadruple what my mom said to. My mom had told me how essential the spices were to the soup. The oil soup. One needed the belentientien (Heinsia crinita; Atama to the Efik) and atariko (part black pepper, eucalyptus, very aromatic) to ‘cut’ through the richness and the fat, providing that slight acidic balance which creates layers and dimensions of flavor , including sweet and bitter, in the same way that cooks in the West use vinegar and lemon juice to give the dish some ‘acid’. One definitely needed the bitter leaf finish at the end. “Every Nigerian soup benefits from it”, she said. It is interesting to see how cooks across the world achieve the same results with different ingredients, indigenous to their locales. Finally the soup was ready and I was excited. As excited as my husband – he had no idea this would test his new-found love for me. One dip of a morsel of Eba and it was clear to see, this soup was a disaster in almost every regard. First of all, I could finally taste all of the spice mix. You know, the spice I couldn’t taste while it cooked! All the spice mix that I shouldn’t have added and it was all wrong – bullish, overpowering and controlling rather than a quiet, strong thread of flavour running through. But that wasn’t the worst part. The absolute worst thing was the bits of broken shrimp shells and the strands of prawn tentacles that littered my soup. It was like a beach picnic, gone wrong. A picnic where someone, in annoyance launched a handful of wet sand which landed right in your Vichyssoise, and muddied it. But I didn’t realize all this till we sat down to eat, soups ladled into locally made clay pots called Evwere. The soup which started out liquid, and finished liquid had been transferred to the Evwere, where the magic of claypots was invoked. Slightly thickened and ready for the devouring. The first ball of the eba, pinched off the mound was dipped into the soup. My eyes were alight with expectation and excitement – I wondered how he would like it, eager as I was to impress him. 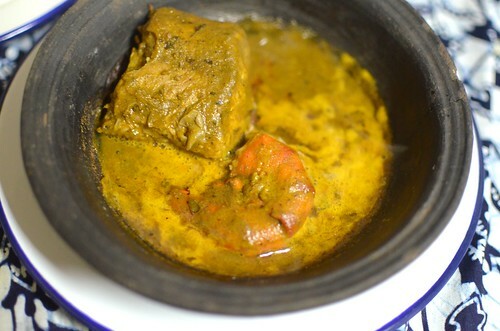 The clay pots are essential to the ‘authenticity’ of Banga soup. One buys them from the town markets, dark and dusty, freshly fired. At home, you season the clay pots. I liberally rub palm oil all round the clay pot interior, and then I heat it up gently on a stove. It warms up, and I allow it absorb some of the oil before I turn off and let the pot cool down. Once cool, I fill it with water, repeat the heating and then discard the water – my pot it ready to use! 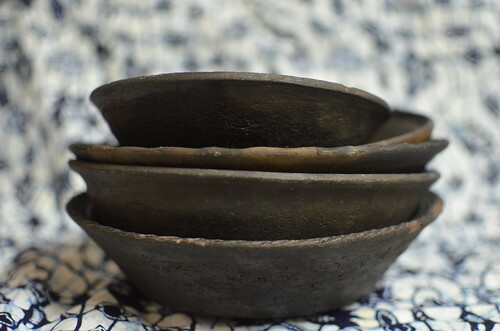 Interestingly, growing up, all my father’s meals were cooked and served in clay pots. My dad was traditional to the core. And he tempered it well. Swallowing slowly before saying ‘Its not bad….for a first try’. You know those words. That hide the truth. That shield expectant hearts from extreme heartbreak and are full of ‘kindness’. I was aghast. Ashamed even. All my expectations had been crammed into the little clay pot and it was dashed….. The soup was tasty, somewhat……but…..it was no way what it should have been. But still, my husband loved me, acknowledged the efforts I’d put into trying it out and we soon ate up the pot of soup – he ate it with plain boiled rice – it was easier to stomach than any of the other starches. Fast forward ten years on and I’m now a dab hand at making banga soup. Most of it learnt while ‘in diaspora’, living in the Netherlands. It was there I discovered that one could get cans of palm butter. Even my mother was stunned at how good it tasted. Perhaps it was because we were ‘abroad’! Anyways, back home I continued to buy tins of already processed palm nut juice for I don’t believe that everything of virtue, or worth, of value must be gotten by hard work. That was till a visit to Warri, my hometown last December when I tasted banga soup made from fresh palm butter. 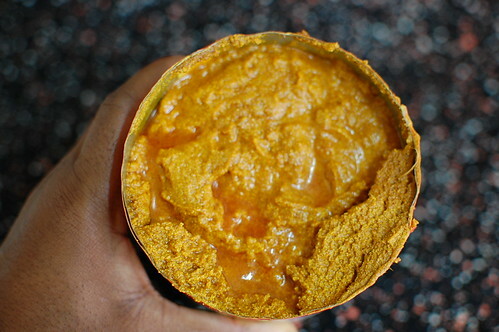 It had a bright orange colour, was lighter and sweeter than that made with tinned palm nut. Truth be told, I got to a point of wanting to experiment. Of wanting to make 2 pots of soup – one with fresh and one with tinned palm butter. 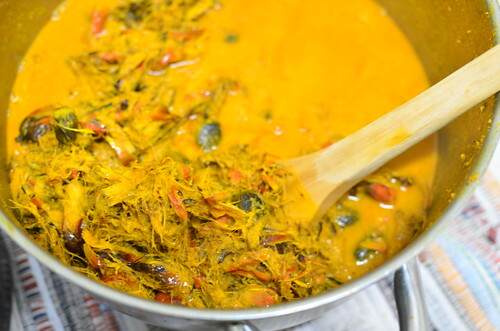 Variations of the soup include okro and egusi (pumpkin seeds), to thicken the soup, scent leaves (a member of the basil family), bitter leaves, etc. Due to the labour intensiveness of making this dish from scratch, I boil up a large amount of palmnuts…..lets just say, its like making apple butter during a harvest, why use a dozen apples when you have 6 dozen more in the barn? Bring to the boil, and then turn the heat down to medium-low. Allow the nuts to cook for 15 – 20 minutes, till the hard, fibrous flesh softens and slides easily off the nut. 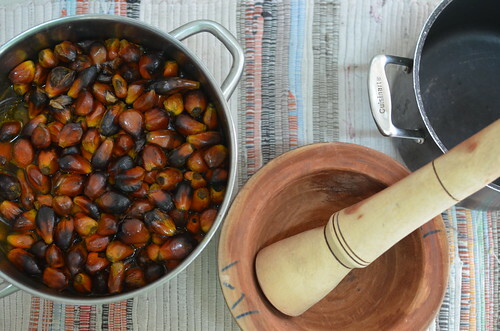 In a mortar and pestle, bruise the palm nuts, being careful not to crack the kernel which houses the nuts, similar in texture and taste to the coconut. Put the bruised nuts in a large bowl or pot, note that you may have to do this in batches. Once complete, pour 5 litres of just boiled water over the nuts and leave it to work its magic for a few minutes. The aim is for the water to pull out the essence of the palm, colouring and flavouring the water till a loose sauce forms. Using your hands and when the temperature is workable, work the nuts and chaff to extract as much thick juice and cream as you can. 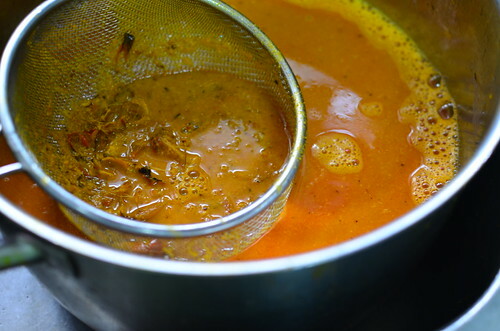 Strain it through a sieve and reserve the liquid for the soup. You can discard the chaff. 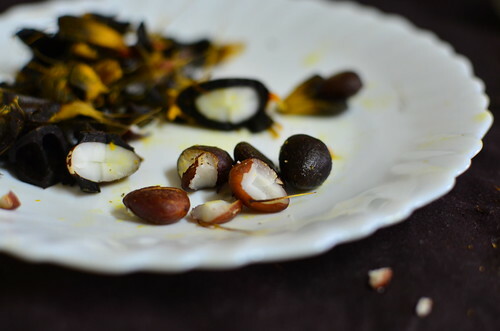 The nuts can be air-dried for a few days – this will make them easier to crack and extract the ‘palm kernel’, the coconut-tasting small nut at the centre, similar to coquito nuts. 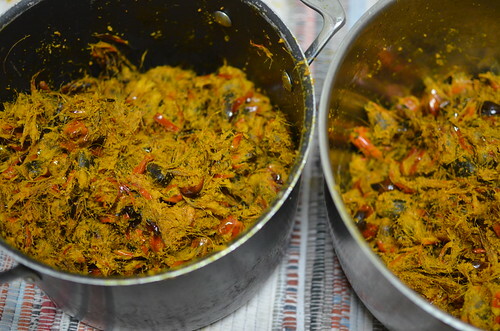 For both methods (tinned or fresh palm nut sauce), begin by putting the palm sauce in a large pot with the blended onion and chili mixture, ground crayfish, banga soup spice, belentientien, stock cubes and the banga spice stick (whose name I am yet to discover). Cook on medium-high heat, for about 15 minutes. 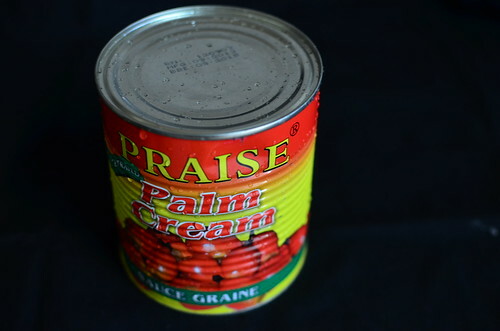 The tinned version is a thick concentrate which requires the addition of water. It is also quite oily; while the fresh version is liquid and requires cooking down to concentrate the flavours and thicken the sauce. Add the chicken and beef, along with the shrimp head liquid. Cook on medium-low heat till the meat is tender, checking for seasoning and adjusting accordingly. The soup should be reduced by at least a quarter to a third. Add the fish and shrimps/prawns once your meat is cooked, along with the fresh bitterleaf. Do not put the lid on the pot, so the soup doesn’t turn too bitter, and also stay too liquid. Gently stir and leave to simmer for 7 – 8 minutes, being sure not to stir too vigorously so the fish doesn’t break up. Remove from the heat and serve with a starch. Note, I deliberately make a huge amount and then portion into meal-sized containers so whenever the craving strikes, I can pull out a bowl from the deep freezer. 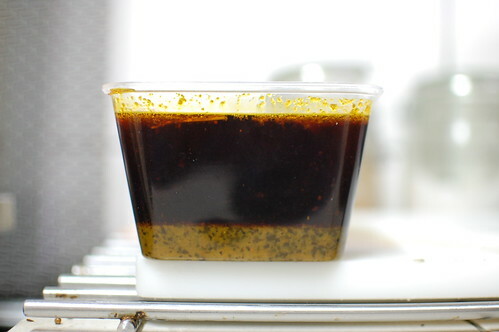 The concentrate, is extremely oil so once cool, scoop or decant the excess oil and reserve for Banga rice, a Jollof rice style dish made with the Banga sauce. 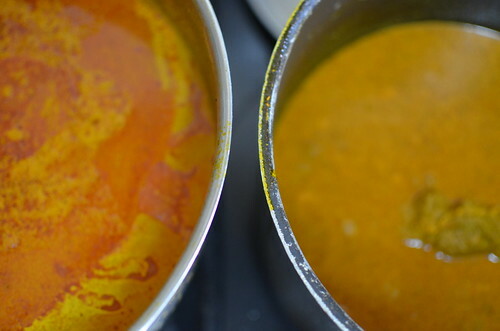 Both soups had different colours – with that made from fresh sauce being more orange, versus the orange-brown of the tinned. In terms of consistency, both were similar. And finally, the crucial element – taste? Well, there was the surprise, B&I preferred the soup made from concentrate but we were the only ones. Everyone else like that from fresh. I found the ‘tinned’ version had what I describe as the ‘banga essence’, a lingering taste which distinctly said delta to me. The fresh on the other hand was actually sweeter, and tasted fresher, younger almost. As though some flavour still needed to be developed. Saying that both were equally delicious! Let it be known that this soup rocks the house, my home and leaves my husband happier than can be and in love with me….and my banga soup. For all’s well, that ends well. In a clay pot.